thousands every year over gas-powered tools. With exceptional power, long run times, and ergonomic design, EGO POWER+ Commercial Backpack Batteries are perfect for all-day use and compatible with all Commercial Series tools. Fast recharging lets you go from empty to full in just 3½ hours, and the high-quality cells can handle up to 1,000 charge cycles. With a super-robust casing and an IP56 rating, it can take hard knocks or heavy downpours in stride. • LONG RUN TIMES: Get longer run time than gas-powered equivalents—a full day’s work** from a single charge. • ERGONOMIC: Battery harness lets you carry the weight on your back for extended-use comfort. • RATED IP56: Resistant to dust and extreme weather, so you can tackle any job in almost any conditions. Introducing the most powerful handheld blower on the market. With over 595 CFM on Turbo Boost mode, the EGO POWER+ Commercial Blower sets a new standard: more power, longer run time, and more than 60 times quieter than leading gas blowers. And the high-efficiency brushless motor reduces vibration for extended-use comfort. • VARIABLE SPEED: Dial the power up or down to match the job. 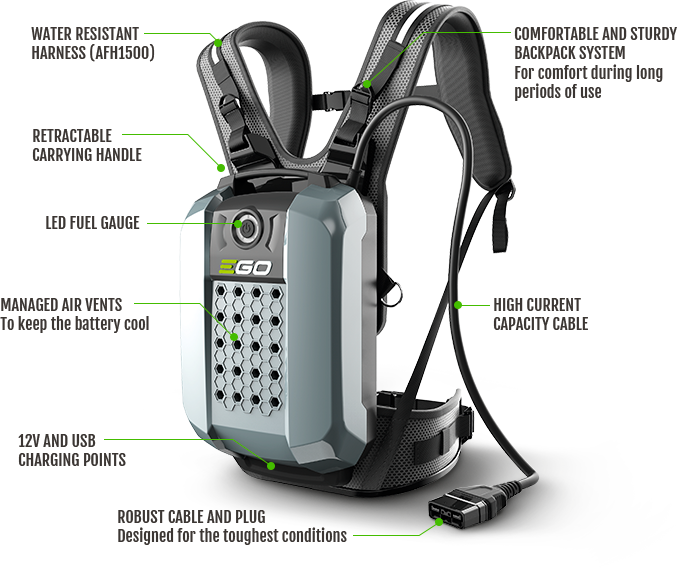 • LIGHTWEIGHT & EASY TO USE: Battery harness lets you carry the weight on your back for extended-use comfort. • RATED IPX4: Rugged, weather-resistant construction can tackle tough jobs in all kinds of conditions. The EGO POWER+ Commercial String Trimmer makes short work of even the thickest weeds. Together, the 2,000 watt brushless motor and industry-leading battery deliver all the power of gas with longer run times. The light and strong carbon fiber shaft and durable cast-aluminum housing are built to withstand professional use, day after day. • CARBON FIBER SHAFT: Lightweight, yet amazingly strong—and it won’t bend over time, so vibration is minimal. • BRUSHLESS MOTOR: Finish the job—the powerfully efficient motor delivers longer run times. The EGO POWER+ Commercial Hedge Trimmer is precision-engineered to tackle the toughest hedges—delivering the power of gas trimmers plus longer run times. Designed for professionals, it has a high-efficiency brushless motor, a serviceable gear box for easy maintenance, laser-cut blades for clean cuts every time, plus a 1.3” cut capacity—the largest in its class. • STAY-SHARP BLADES: Steel blades with diamond-ground edges are laser-hardened to stay sharp longer than conventional blades. • UNIQUE HANDLE & TRIGGER DESIGN: Lets you switch effortlessly between horizontal and vertical cutting. *Cost of charging according to KW pricing in US. **Cost of gas mix based on published US pricing. †Gas equivalent of .8 gallons per day.